Data centers are going through a true revolution in design, scalability and economics in order to respond to evolving business demands, which have forced IT organizations to move at warp speed to evaluate, select and implement new technologies. The pressure is on to select the right IT platform to transform the data center from expensive, stodgy and rigid to agile, cost efficient and lithe. This rapid change can seem scary, but the reality is we’ve been down this path before. Server virtualization was a major step forward for data centers; it delivered efficient, cloud-like computing in its different iterations. All too often, however, infrastructure managers and data center administrators were hampered in their efforts to extend those same virtualization benefits to storage and networking. Organizations are discovering that proven, high-performance options are widely available to build out a software-defined data center (SDDC). Research indicates that SDDC market growth will exceed 26% on a compound annual basis, with worldwide market revenues eclipsing $83 billion by 2021. Continue the rapid pace of innovation in implementing virtual infrastructure that lowers total cost of ownership and improves long-term scalability. Support innovative infrastructure designs such as hyper-convergence in the long-overdue server refresh cycle. Enable proactive management and predictive maintenance that spans the entire SDDC for both local and remote resources. Fortunately, VMware has made SDDC and data center modernization a high priority throughout its product portfolio, particularly with its popular and widely adopted hyper-converged storage software, VMware vSAN. While thousands of enterprises have adopted vSAN, VMware has maintained and even accelerated vSAN’s pace of innovation to help data center managers keep up with the exciting developments in hyper-converged infrastructure (HCI). Focused on lowering operational costs with intelligent and automated infrastructure, VMware has made important new upgrades to vSAN. In addition, HCI solutions powered by vSAN are further bolstered by a strategic collaboration with Intel on the latest x86 architecture that is likely to be a key element in enterprises’ next server upgrades. 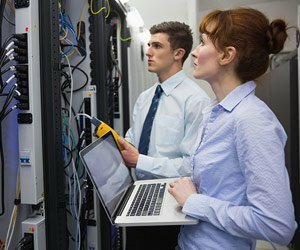 How can networking and storage HCI benefit your company? Here are the four characteristics of a future-ready solution. VMware’s latest moves align tightly with the three major initiatives highlighted earlier in this article. Lower operational costs with new vSAN release. The seventh generation of vSAN—version 6.6.1—further trims operating costs by streamlining and removing common tasks. vSAN 6.6.1 introduces a single-click tool to upgrade to new releases, the easy identification of failed storage devices for quicker maintenance and faster performance tuning by adding performance diagnostics to vSAN Cloud Analytics. Enjoy a competitive advantage with HCI powered by vSAN and the latest Intel x86 architecture. Many IT organizations have been craving upgrades in performance, scalability and cost efficiency for their x86 server infrastructure, and the new Intel Xeon Processor Scalable Family is designed to meet that need. VMware and Intel have teamed up to reduce IT costs by enabling 2.5 times more virtual machines per cluster, resulting in greater workload density. HCI solutions powered by vSAN and this latest x86 architecture were available on Day 0 to help customers improve application performance, lower latency and deploy the latest flash storage technologies. Expand management and monitoring of complete SDDC and multi-vSAN clusters. As vSAN deployments increasingly expand across the enterprise, IT executives have set their sights on native HCI and vSAN support for their existing management. The new vRealize Operations 6.6 management framework supports native vSAN integration, enabling one-click vSAN monitoring. The new management software is well suited for large-scale data centers demanding multi-cluster management, predictive analytics for performance and capacity management, rapid troubleshooting and easy monitoring. vSAN 6.6.1 represents VMware’s focus on helping customers lower costs and discover greater agility through SDDC and data center innovations. This strategy, including its partnership with Intel, goes a long way toward enabling concurrent implementation of new virtualization features for both compute and storage functions in HCI environments.